These waffles have saved me from what may have been the longest breakfast rut of my life. MY LIFE. It was all oatmeal with peanut butter + jam or berries for a while there, folks. And by a while, I mean months. Months and months of the same mushy bowl of goo. OK that’s a bit of an exaggeration, because there was that one time I had this for breakfast and a couple of times doughnuts were involved. But otherwise — lots o’ oatmeal. I was starting to feel like my body was turning into 50 percent old-fashioned oats. So thank heavens these waffles came into existence, as I am now made up of about 25 percent oats and 25 percent waffles. Much better. But I digress. Because the real reason I’m here today isn’t to talk about my carb-loaded breakfast habits, but rather to say that I’m guest posting about these delicious, maple-infused cornbread waffles for my lovely friend Audra of The Baker Chick while she gets settled into life as a new mom to a beautiful baby boy. So because it’s Friday and you need something to distract you until quittin’ time, and because everyone likes waffles (and if you don’t, please send me all your waffles in the mail), head on over to Audra’s blog for the recipe for maple cornbread waffles. That sounds like a pretty good ratio to me–now you just need to add back in a percentage of doughnuts! These look so great Steph! Love this idea of using cornbread!! Sounds amazing. Perfect project for a weekend! 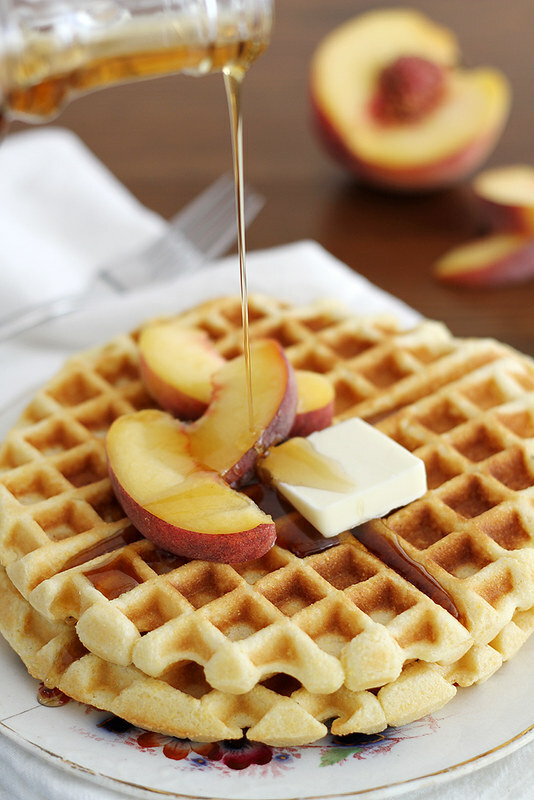 Mmm these look like the perfect switch-up on traditional waffles! Yum! Heading over to The Baker Chick to check it out the recipe! My waffle make has been hiding in the back of a cabinet for way to long. Thanks for giving me a great reason to bust it out this weekend! YAY! I’ve been brainstorming something to make this weekend as a treat, and nothing has sounded very fun. These waffles, however, are totally tickling my fancy. Pinned for a lazy Saturday morning. Laura — The doughnuts are the other 50 percent. 😉 jk Thanks dear! I’m SUPER excited about the book, too! Ali — I wish I’d know about cornbread in waffles sooner because it is DELISH. Thanks, friend! Erin — So glad your fancy has been tickled by these waffles. Wait, that came out weird. 😉 Happy weekend! Girl Yes!! This is right up my alley.. These waffles are absolutely gorgeous!!! Wow, these waffles look amazing, Stephanie! Love how you incorporated cornmeal into them. I love the addition of cornmeal, it must make for an awesome texture! While I like oatmeal, there’s no way I could subsist on months of it for breakfast! You’re a champ. These waffles on the other hand, I could probably eat all day every day. Heading over to the guest post to check ’em out! I would adore the numbly texture of corn meal in these! They are gloriously yellow steph; perfect for sunday breakfast. 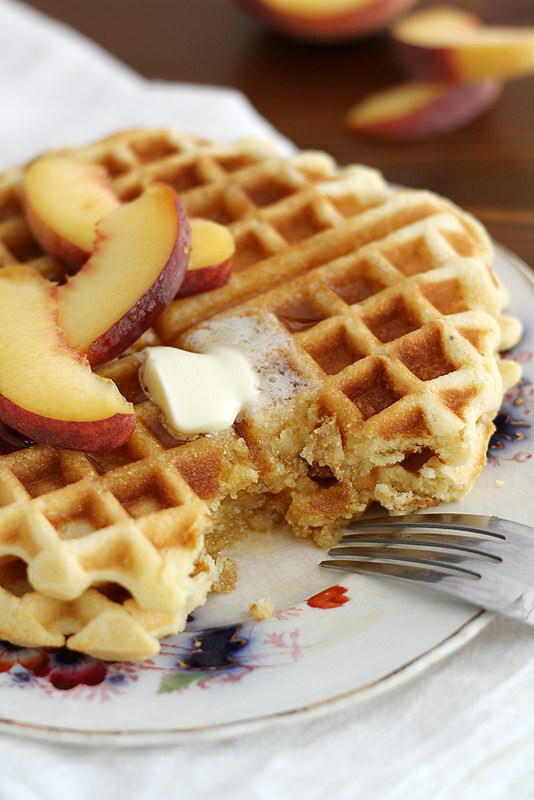 Yes please to maple and cornbread, these waffles look dreamy! These look AMAZING. I’ve never made cornbread waffles before but considering how much I love cornbread, I really must give them a try! Loving this flavour, friend! Such a nice breakfast recipe! Erika — Can we have a waffles and beignets date someday? SAY YES. Caroline — Thanks, friend! I wish I’d been putting cornmeal in waffles sooner; it’s good! Amanda — It’s just like cornbread, but better (probably because of the whole maple syrup-butter situation ;)). Personally, I love you breakfast choices. I mean doughnuts? You just cannot go wrong there! BUT these waffles?? Dear gosh, they look and sound amazing! Maple cornbread! Yeah! Yay for waffles!! They make me so happy…though I tend to eat them more as breakfast-for-dinner/lunch instead of actual breakfast lol. Off to check out your guest post! Tieghan — Ha, well I suppose the doughnuts at least were a good choice. 😉 Thanks girl! Oh my gosh. These pancakes look SO perfect. I could totally go for one right now with my tea. Come over? I have a waffle maker… haha. Stephanie these waffles look delicious! Going to check it out! Have a great weekend too. Ohhhh … it’s quite possible I may soon become 100% waffles. Is that wrong? I’m totally loving the cornbread – so very, very smart! 🙂 My littlest loves waffles (that’s her go-to breakfast every morning) and she loves cornbread, so I already know this will go over quite well at my house! YAY!! Hehe, I love your breakfast choices – I know what you mean about the oatmeal rut though and am still going through it but luckily I always have room for waffles and pancakes 🙂 These waffles look incredible Steph! I love the sound of the corn meal in here for that lovely crunch – sounds ridiculously good! So glad I came across these. We love waffles in our house and will eat them at any meal and especially dessert!